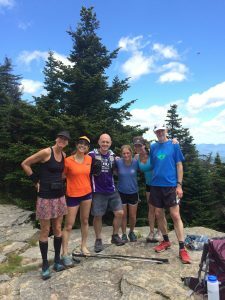 Now, taking six, eight, even ten hours out on a trail can be a challenge to anyone with a family – which is one of the reasons I couldn’t join the ultra “club” in years past. (From conducting countless pop polls, it seems that most ultra runners either don’t have kids or are empty nesters). And yet, it has to be stressed, these all-day outings can make your weekend far more than they tend to break it. When I look at this past year, some of my favorite days have been the ones spent on the trails, either on my own, with a friend or two, or with an organized group, such as the “night run” that prepares Manitou’s Revenge competitors for running with headlamps. While in Northern Ireland for a wedding, I hike-ran the Mourne Mountains. 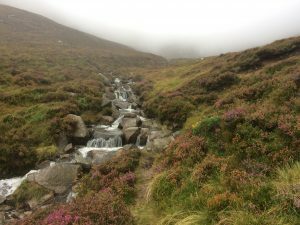 A new adventure – and counts as training! These lengthy periods on the trails can be used for more than just training. I find that going solo offers me a chance to catch up on podcasts and new music, to let my inner dialogue talk itself out, and hopefully for some meditating with nature. And with friends, I have all the benefits of social interaction without sitting around in a noisy environment – and there’s often a six-pack waiting in someone’s car anyway! For those who understandably worry about the strain of all this time away upon their domestic relationship, think of the pay-offs. There are few spouses/significant others that don’t like to have a super-fit partner – as opposed to an obese or simply out-of-shape one – climbing into bed at the end of each day. If you can fully commit to your family on the other weekend day, chances are you’ll get a pass – at least while you train for your first big race. Beyond that is up to you (both). A group hike on top of Slide Mountain – highest point in the Catskills. Still counts as training! Continue to Part 9: Plan Every Step.